Whether you want to take a Christmas card picture or you are on vacation with your family and think, “We should take a family picture here.” The last thing you want to do is trust that moment (and your camera) to a stranger. If you’re like me, you are always behind the camera taking pictures but rarely in front of it (in my case, that may be a good thing). When I want to be in the picture, I struggle with the idea of having a stranger take the picture. Besides the risk of having the camera dropped (or worse, walk away), I want the picture to be a good one, and I am picky about the pictures I put on my wall. So I had to learn how to take self-portraits. My first attempts weren’t perfect, but yours can be if you follow the procedures I describe below. To take a great family self-portrait, you need to learn is how to set your camera in such a way that everyone is in focus and the background is out of focus; even if only a little bit (called “Depth-of-Field”). But none of that matters if you can’t get your family to smile looking directly at the camera. If you have small children – as I do – this can be a challenge. When you take a self-portrait, you won’t be behind the camera to say, “Smile!” And smiling at an camera doesn’t make sense to a child (or adults for that matter). I find it best to bring a stuffed animal with a goofy looking face and I set it right on top of the camera (straddling the lens). It’s easy to pack and it gives everyone something to smile at, and young children will give you a genuine smile. I take more pictures with my Sony RX-100 III point-and-shoot camera than I do with my Canon EOS 5D Mark III digital SLR camera. I am a huge proponent of keeping a point-and-shoot buy your side at all times, but this is one of those situations where the digital SLR earns its keep and definitely is the right camera to bring to the party. 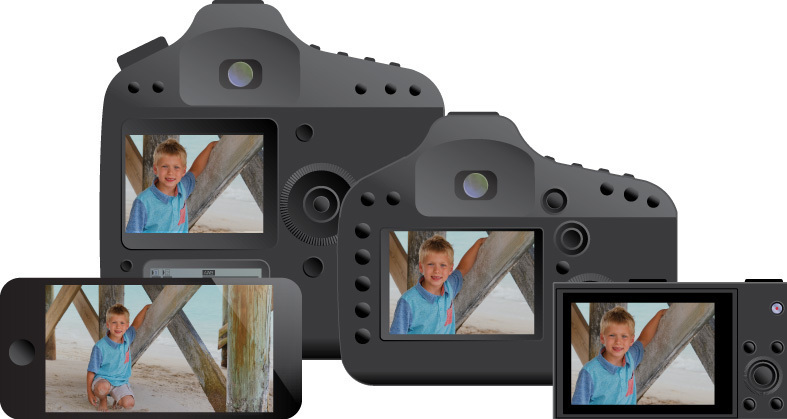 In their defense, today’s point-and-shoot cameras are so sophisticated that they can automatically detect faces and make the necessary adjustments to make sure that everyone is in focus. Unfortunately, those features work best when someone is behind the camera making sure all the faces get detected. Also, if you want a professional-looking picture, the lens on a point-and-shoot camera usually doesn’t give you that wonderfully blurry background. This truly is where having an SLR and an overpriced lens really matters. 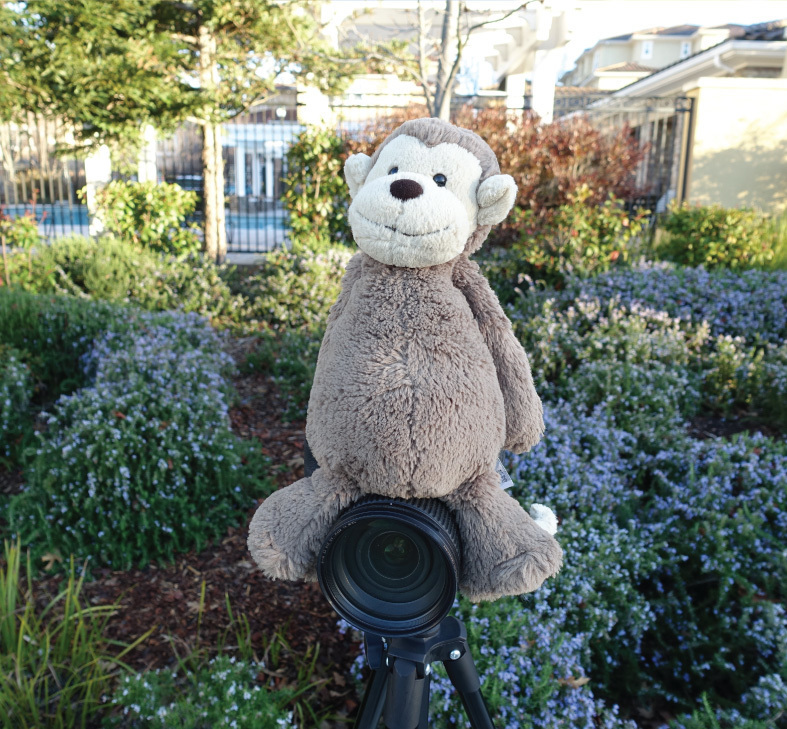 Photo Tip #3: Bring a Tripod! If you think you’ll be somewhere where there may be good photo-opportunity; bring a tripod with you. With a tripod, you have the ability to take a self-portrait whenever and wherever you want. That said, a 6-inch tall tripod or a tripod that wraps around a pole won’t cut it if you carry a digital SLR with a quality lens. But doesn’t have to be a big, expensive tripod either. I have an inexpensive, lightweight, collapsable tripod in the trunk of my car at all times (and I have a point-and-shoot camera with me at all times too). And when I travel, I make sure to bring it with me. But inexpensive tripods are inexpensive for a reason. They aren’t super stable (which is why you want a tripod in the first place). One simple trick is to hang your camera bag (after about an hour of walking around, you know it’s pretty heavy) from the hook under the tripod or in such a way that it dangles from the middle of the tripod. This little bit of extra weight makes tripods of any price waaaaaaay more stable and less likely to wobble when the shutter mirror pops up or when you press the shutter release button. By the way, I never remove the tripod mounting plate from my camera. Fumbling about trying to attach the tripod mounting plate can be a hassle when you are in a hurry. And if it is a hassle to use a tripod, you won’t use it. Leaving the mounting plate on your camera means it is simple to slide your camera onto the tripod and keeps your tripod from becoming an expensive closet decoration. Now for the good stuff. It is not enough to simply press the button to focus your camera, the aperture has to be set as well. Depth-of-field is caused by the aperture in your lens and can give you a wonderfully fuzzy, out-of-focus background; but you don’t want the people to be out of focus too. To ensure this doesn’t happen, I recommend using the automatic features on your camera to help you get the right settings, write down the settings, and then put your camera in aperture priority mode (or full manual mode) to make sure the settings remain constant from picture to picture. If your camera has A-DEP or DEP (automatic depth-of-field) to judge distance, use it. What this feature does is asks you to point the camera at the closest object and press the shutter release button half-way down (to measure the distance), then it asks you to do the same for the farthest object. Finally, you press the shutter release button all the way down to take the picture. The camera takes the readings from the first two steps, calculates the best aperture and sets the focus in between the two measurements so the objects are in focus (and the background isn’t). For the picture at the top of this blog post, I had my son sit where I was going to be to give me a reference for focusing. 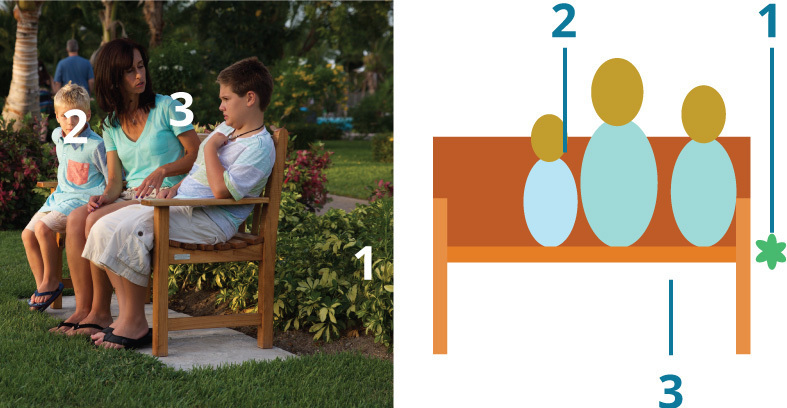 I then used the A-DEP feature to measure the distance between a plant (just a bit closer than the bench) and my youngest son, and pressed the shutter release part-way the third time (and remembered the aperture setting) then finished taking the picture (without me in it). FULL STOP … don’t touch your camera! If you think about it, at this moment in time (right after taking a test shot), my camera’s lens is set to focus at the perfect distance. I can lock that in by turning my lens from autofocus to manual. Once I do, the only thing I need to do is set my camera to aperture priority mode and set the aperture to the number I memorized. Change your camera’s shooting mode from single-shot to a 10 second delay. DONE … The camera is set up. 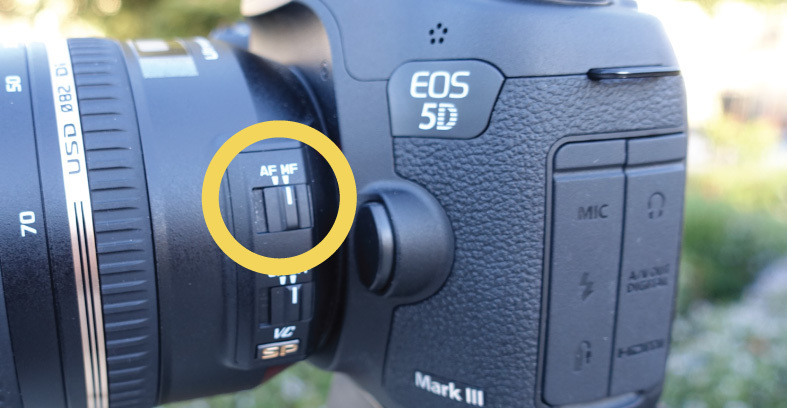 NOTE: If you forget the aperture setting, digital cameras have a “display” mode that will show you the settings the camera used for each picture. All you need to do if review the picture you just took with “display” turned on and get the information directly from the camera screen. If what I described is just too difficult, I’d say it is better for your subjects to be in focus than to have a fuzzy background. For most digital SLR lenses, an aperture setting of f8 will give you a result where most everything is in focus (unless the background truly is a long ways away). Just remember to focus on a person in the middle of the pack. What seems like a good plan for a family portrait when you leave the house seems like a royal pain after six (6) days of travel and sight-seeing. I am one who likes to get the planned activities over with so I can relax. So I try take the family picture in the first couple days of our trip. Besides, if everyone gets sunburned, no one will want to remember that agony. If you are interested in further developing your skills, we offer self-paced, video-based digital photography courses. 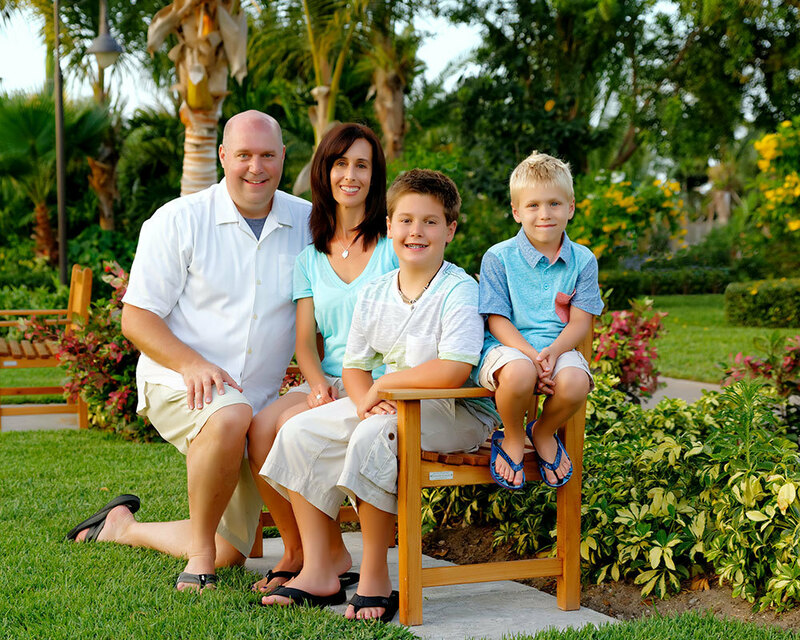 Doug Marshall is a freelance photographer, photography instructor, professional blogger and pizza enthusiast. You can follow him (dougmphoto) on Facebook, Twitter and Instagram. All of our products come with a 30-day, 100% money-back guarantee. If you are not happy with the course and what you've learned, simply email support@modernphotographycourse.com, tell us you want a refund and we'll process your refund in a timely manner.